What is it about chicken wings that makes our mouths water? The answer is everything! A deep-fried wing, smothered in a tangy or zesty sauce that you then dip into a rich, creamy dressing, is just about one of the best appetizers there is. These 10 New Mexico spots bring their own perspective to this popular snack. Here are the best wing joints in the state. A chain, yes, but the wings are hot, spicy and consistently tasty. Choose from a selec-tion of boneless strips, boneless bites or bone-in and 21 different types of sauce. Hot favorites are the wacky tabasky, scorchin’ cilantro lime and the blackberry habanero. Take the heat off with something from the bar—bottled and draft beer or a refreshing margarita. Look for the grey and red mobile food unit (aka food truck) in the parking lot next to Goober’s, a local store. The family who owns it specializes in making traditional bone-in chicken wings. The finger-lickin’ good wings are crispy and juicy—cooked to perfection. The spectrum of sauces goes from the very hot ghost buffalo to the sweet teriyaki. The truck is in town only on Saturday and Sunday, but if you miss it there you can catch it on Mondays and Thursdays at Cannon Air Force Base in front of the Base Exchange. This cozy, family-run restaurant serves both boneless and regular wings with a mixed-bag of hot and not-so-hot sauces. A few of the hot: Hell Fire, billed as only for the reckless and daring, Cajun Kicker, apparently a Mardi Gras in your mouth. On the cooler side: Sweet and tangy Polynesian and savory and zesty lemon pepper. Order 10, 20, 35, 50, 75 or even 100. Jamaican flavors abound in the house spicy wings cooked in jerk sauce and served with more jerk sauce on the side. They’re hot! These are just a precursor to the really hot Wings on Fire, boneless wings tossed in salsa diablo with chopped habaneros. Neither are for the faint-of-heart! Hot and spicy is the point for these meal starters. Tender, juicy and mouthwateringly and finger-licking good. Craft beer in the house, as well as a good selection of specialty margaritas. Wings are the quintessential bar food and Del Charro’s is the quintessential rustic, western-themed watering hole. It’s a match made in Tex-Mex heaven. Their zesty chipotle boneless wings are good-sized and a meal in themselves and served with traditional sides of blue cheese dressing, celery and carrots. For those in the not-so-hot audience, on the menu are wings in a sweet chile sauce and served on a bed of mixed greens with ranch dressing and pickled veggies. Voted “Best Bar in Santa Fe” last year for good reason. Finger food should be fun and Farley’s is all over that with their jumbo boneless or bone-in wings that capture the concept of messy finger food. Order them tossed in a variety of sauc-es—Buffalo, barbecue, honey mustard, sriracha, boom boom, Thai chile, sweet ginger or extra hot. All are served with the customary carrot and celery sticks. Grab a chair on the outdoor patio and listen to some music or watch your favorite sports team inside on the extra-large TVs. If you see a bright yellow building with a home-cookin’ banner emblazoned on it and a bright red chicken encircled by the name of this place, go in. You’ll find some of the best wings in town complemented by some of the best waffles around. This Southern tradition is given a southwest flair—waffles are topped only with wings. No matter, the crispy chicken wings are fantastic. They come super hot out of the fryer and are served in quantities of six or 12 and smothered in either the original, funky or honey hot sauce. Located on the historic Taos Plaza, an appetizer of classic buffalo hot wings eaten at this notable spot is indeed something for the history books. The meal, a generous num-ber of wings served with ranch dressing, celery and carrot sticks, hits all the wing bells and whistles … spicy, sweet, tangy and melt-in-your-mouth good. Everything here is made from scratch and with a commitment to using locally grown and sourced foods. Fusion is what’s happening with Big D’s Bangkok chicken wings, a blend of Asian and Southwest flavors that pack a wallop. The sauce is a mix of honey, lime, sriracha, soy, sesame, cilantro, basil, chipotle sauce that covers the good-sized, meaty and crispy wings. The flavor is so unique that the wings bring visitors in from around the state. Fresh and local ingredients are used as much as possible and when available. If you’re looking for great chicken wings in Gallup, this little hole-in-the-wall is the spot. The wings are big, with lots of meat on the bone. A good choice of sauces, which they do not skimp on, include plain, mild, hot, barbecue and sweet teriyaki. 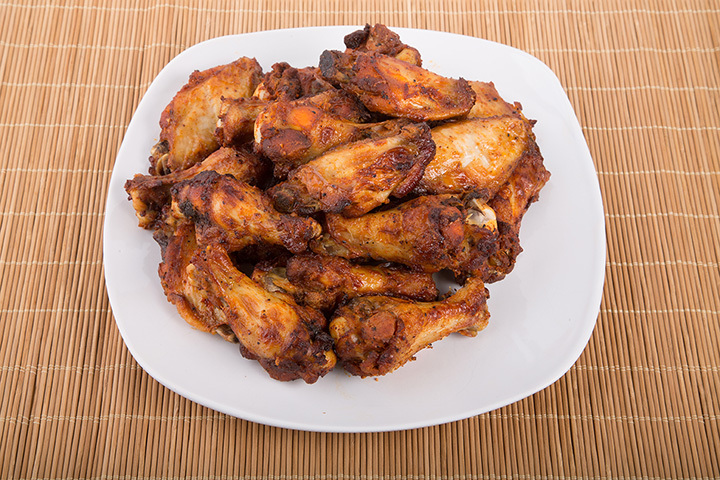 Wings are served with blue cheese or ranch dressing and celery. Orders come with six, 12, 20 or a platter of 50.